Simplify risk assessment, reduce fraud, and ensure the integrity of your address data with DOTS Address Validation – International. An address validation service is a must have tool for every business. Choosing not to use one can lead to expensive losses in time, money and resources. However, you don’t want to use just any address validation service. Gain peace of mind knowing that you are covered by one of the most powerful international address validation services on the market today that is backed by an industry leader in the contact validation field. You wouldn’t want your business to be restricted by borders, so why should your address validation service be any different? Instantly correct, verify, and standardize addresses from all over the world, from anywhere in the world. One simple web call is all you need. 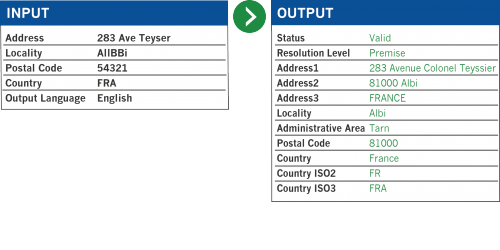 The DOTS Address Validation – International web service can be accessed from just about any platform that utilizes an internet connection. Simply submit the address that you wish to validate and instantly get back the validated and formatted address. Try out DOTS Address Validation – International today and test it out for yourself!